Expressing satisfaction of the action taken by Election Commission of India against UP CM Yogi Adityanath, BSP Chief Mayawati, BJP leader Maneka Gandhi and SP leader Azam Khan yesterday, the Supreme Court adjourned the hearing of a PIL seeking action against hate speeches during election campaign. "It seems you have got your powers now...now the Election Commission has woken up to its powers", quipped Chief Justice Ranjan Gogoi. 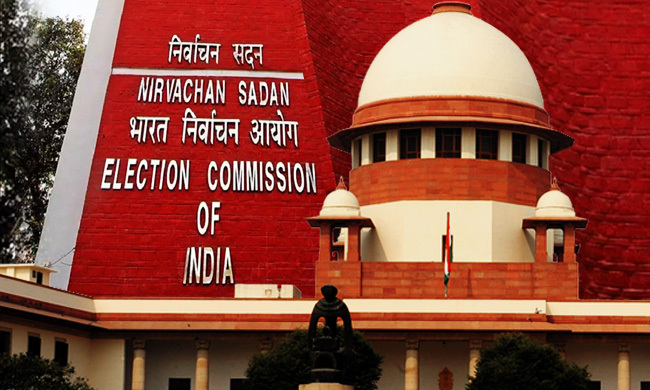 The Supreme Court bench, also comprising Justice Sanjeev Khanna, was considering the ambit of power of the Election Commission to take action against the political parties who drag religion and caste in political campaigns. The CJI-led bench observed that no orders were necessary at this stage. However, the petitioner has been granted liberty to move the petition if felt necessary later. In the light of instances where BSP Chief Mayavati and UP CM Yogi Adityanath have appealed for votes on the basis of religion, Chief Justice Gogoi had on Monday inquired from the Commission about the course of action adopted to tackle these violations of the Model Code of Conduct. The ECI had submitted that it was "powerless" to act against those violating mode code of conduct during campaign. ""The power of the ECI in this behalf is very limited...we can issue notice and seek reply but we can't de-recognise a party or disqualify a candidate", the ECI had informed. When the Chief Justice asked Senior Advocate Sanjay Hegde, who was appearing for the petitioner, if the ECI indeed could do only so much in the face of communal pleas for votes, Mr. Hegde asserted that the powers of the Commission under Article 324 are quite extensive. Accordingly, Chief Justice Gogoi directed a senior representative of the Commission to be present in court on Tuesday to assist it in examining its power. Subsequently, the ECI passed orders against Yogi Adityanath and Mayawati yesterday afternoon, barring from campaign for 72 hours and 48 hours respectively, starting form 6 AM today. Adityanath was found to have referred Muslim League as 'green virus' and had made references to "Bajrang Bali" during an election speech. Mayawati was found to have communal appeal for votes to Muslim voters. This was followed by late night orders against Azam Khan and Maneka Gandhi, barring them from campaign for 72 hours and 48 hours respectively starting from 10 AM today. The action against Khan was based on his objectionable remarks against BJP candidate Jayapradha. Maneka Gandhi was found to have made communally polarising statements against Muslims. Taking note of these orders, the CJI remarked "It seems ECI has woken up to its powers". "We found we have powers", replied Sr Advocate Aryama Sundaram appearing for ECI. The Court is dealing with a PIL by Harpreet Mansukhani, an NRI, to take action against the political parties who drag religion and caste in political campaigns. She prays in her writ petition, to constitute a committee under the Chairmanship of retired Supreme court Judge to have a 'close watch on entire election process' and to 'check the loyality of election commission'. Today, Mayawati had sought intervention in the matter to challenge the ban imposed on her. "The orders were passed without any remedy! These are drastic measures restraining them from holding public meetings! The ECI acted because of your order and passed ex-parte orders without hearing! ", submitted Sr Advocate Dushyant Dave for Mayawati. But the CJI was not to be moved, and said that the challenge should be made in a separate petition.